Kundalini Yoga International is an educational organization. Our team of teachers consists of Yogi Bhajan’s direct students, professional trainers, and KRI Certified Kundalini Yoga instructors who seek to share Yogi Bhajan’s teachings in the most authentic and genuine way. Why KRI Kundalini Teacher Training? Not all Kundalini Teacher Training programs are the same. KRI certified trainers are part of the official International organization that promotes the teachings of Yogi Bhajan, the yoga master who brought this technology to the West. KRI oversees teacher training programs in over 50 countries worldwide, graduating 3,000 new Kundalini Yoga teachers annually. To insure that the teachings remain pure and undiluted, KRI trainers must teach over 1,000 hours of Kundalini Yoga and work closely with a mentor for 5 – 10 years before becoming lead trainers. This is to maintain quality and consistency in the trainings and to create coherence and credibility in the continued transmission of the teachings of Yogi Bhajan, master of Kundalini Yoga. The KRI Level 1 Teacher Training Program is for any person interested and willing to explore the transformational effects of Kundalini Yoga. No previous yoga or meditation experience is necessary to benefit from this training. Whether you wish to become a certified Kundalini Yoga teacher or simply deepen your personal yogic experience, this course will give you a lifelong foundation for a successful yoga and meditation practice. Those who desire to become teachers will be given the knowledge and experience to become competent, well-rounded, and confident teachers of Kundalini Yoga. The KRI Kundalini Yoga Teacher Training programs are for everyone. This course is the opportunity for you to commit to positive change and to connect with others willing to do the same. 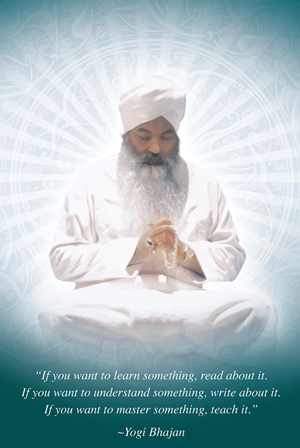 As a certified Kundalini Yoga teacher, you will be trained according to the sacred tradition passed on by Yogi Bhajan to carry the legacy of Kundalini Yoga into the future. You will be working with experienced KRI certified teacher trainers, many of them with over 30 years’ yoga teaching experience and personally trained by Yogi Bhajan. If you are ready to make a quantum leap in inner growth, and devote a year to the study, practice, and discipline of an in depth teacher’s training program, this program is for you. Ten Weeks That Will Change your Life. "This teacher training blew my mind. I have been meditating for about six years, but I gained more from this teacher training in terms of sheer growth than I did in the prior six years of doing other kinds of meditation. I am not just talking about the wealth of knowledge that they shared with us; I am also talking about growth in terms of my sense of Self and connection with the Infinite. I have completely transformed as a person." Find out more about our KRI certified Teacher Training and stay up to date with Community Events, Classes, and Workshops at Cosmic Flow Kundalini Yoga Studio.